Brafman, Daniela. 2008. Center for Independent Living in Jerusalem. Jerusalem 2000. The cold winter months of 2000 boiled with the turbulent demonstrations by Israels disabled population. What began as a struggle to raise National Insurance pensions went much farther, and helped put the issues of the disabled and social discrimination on the public agenda. For 70 days and nights the striking disabled, led by the late Mr. Tzudkevich, to inspire a revolution among themselves and to understand that the power to generate change is in their hands. Memphis,Tennessee some fifteen years earlier. I had arrived in that city in the state of Tennessee in the USA to study. In that foreign city the Center for Independent Living was one of the first agencies to welcome me by giving me relevant information, providing me with a replacement wheelchair when mine suddenly broke, and by simply extending a friendly and welcoming hand. There, for the first time in my life, I could celebrate independence. Equality. Partnership. There, for the first time, I could celebrate myself. The Memphis Center for Independent Living is one of about a thousand such centers operating around the USA. The founder of the first center, which was established on the University of California at Berkley campus on the 1970s, was Mr. Ed Roberts. Ed Roberts, who at age 13 became paralyzed from the neck down, together with a community of other students with assorted disabilities, began to develop advocacy strategies of their own for the handicapped who lived nearby and who experienced a host of problems in maximizing their independence and integrating into society. Their motto was, Nothing about us without us." Labels belong on bottles - not on people. People with disabilities are the only minority group that anyone could join at a moments notice. People with disabilities constitute a minority that is subjected to social oppression, deprived of their rights and discriminated against. In order to change this, they must organize and support one another. Only people with disabilities know what their needs are and how they should be addressed. It is only natural that with this inspiration, a group working toward equal rights for people with disabilities would take root in Jerusalem immediately following the demonstrations by the disabled which, starting in 2000, called itself Disabled Now - The Movement for the Rights of People with Disabilities." Private homes, coffee houses and youth movement centers became temporary action centers for the Disabled Now association. Independent Living as an ideology, as a way of life, a philosophy is a very new idea in Israel. It is quite a challenge to work for Independent living here. The Israeli society is a militaristic one. You better be strong healthy and beautiful etc. This has different implications on how people with disabilities are observed. There are slow changes here (for example the law for accessibility was just passed one year ago), but on the level of the 'street' there is a lot to do. Activity for social change on issues found in the field, for example: Accessibility on the street and public transportation, employment through personal assistance, participation in the legislative process, and more. Friends of the Disabled Now association probably remember the street theater event held in Jerusalem under the slogan, Its simply about accessibility." Public relations activity that has appealed, and continues to appeal, to agencies, organizations, institutes and private individuals, and is aimed at changing the social image of the disabled and recruiting other people with disabilities as active members in the organization. Internal educational forums on rights and how to maximize them, personal empowerment and enhancing knowledge about the history of the struggle by the disabled throughout the world. At that point in time, there was a real desire to establish a Center for Independent Living in Jerusalem. The idea was studied at internal meetings and countless discussions were held to identify the needs that had to be addressed. Plans were written for various projects. At the same time - we held conferences with disabled people and organizations in the community, with professionals and family members of people with disabilities. We established contacts with major bodies and financing agencies within the establishment. A steering committee, began meeting on a regular basis in order to closely monitor the establishment of the first independent living center in Israel. This was a celebration of practical and conceptual collaboration on behalf of this pioneering idea and initiative. 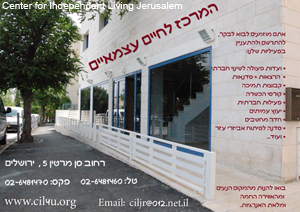 The official birth of the Jerusalem Center for Independent Living took place in 2003. At that time we entered our small cubicle of an office at 43 Emek Refaim Street. For three years in this melting pot, in this laboratory, we experimented, made mistakes, and learned from our errors. Activists, friends and loved ones worked, toiled, monitored from close and from a distance to watch the growth in Jerusalem of a body, a community of people with various disabilities who were seeking to show that the disabled were also capable of establishing and developing the services they themselves needed. That the disabled could run such services and influence the official bodies providing these services. We worked out of this submarine" and our dream of moving into a larger physical space came true after four years. At the end of April 2007, the Independent Living Center opened. We now have a home for our activities and services such as Peer Counseling, courses and training workshops for people with disabilities, meetings for Committees for Social Change in various areas including Accessibility, Employment, Community Awareness, Foreign Aid as well as occasional social activities. Our center is more than a physical place, it is a spiritual space and an existential state. We are turning its walls and the ceiling into an extension of our own character. Decisions concerning how to furnish the house, what pictures to hang and how it should be run must reflect ourselves, our personality, our goals and intentions. We are building a proud community of people with a variety of disabilities who are working to generate a change in Israeli society in how it relates to disability, through action teams on different issues, and by developing services and leisure activities. Only by recruiting individuals will this community be able to build itself and make a difference. Only by interweaving ourselves into the surrounding environment and through openness can this place serve as a center for initiative and social change. The knowledge and experience we have gained thus far will be made available to organizations and groups who identify with these objectives and who also wish to establish independent living centers in other locations. As long as we regard our disabilities as tragedies, we will be pitied. As long as we feel ashamed of who we are, our lives will be regarded as useless. As long as we remain silent, we will be told by others what to do.